Our certified instructors have trained thousands of new sailors during our 46 years on this beautiful lake which consists of 59 square miles of water, and 692 miles of shoreline. You’ll develop your basic sailing skills aboard our popular Capri 22’s. The large open cockpits offer comfort and a great learning environment for your learn to sail experience. 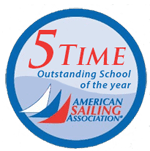 You’ll receive over 16 hours of on the water sailing instruction with no more than 3 students and certified instructor per boat. Graduates of our Lake Lanier, Basic Sailing Certification course can join the Passport Sailing Club. Sailors, already BKB-certified or holding approved certifications are welcome to join the Passport Sailing Club. Once certified, members may sail Lake Lanier as often as they like on any of our 22-36 foot boats. Passport Sailing Club members also enjoy the many, member only, club activities which include sailing clinics and Capri 22 races followed by a club social. Lanier Sailing Academy also teaches Coastal Navigation at our Atlanta location. There are no prerequisites for the Coastal Navigation course and it will add to your confidence and fun while sailing anywhere. Our Lake Lanier location also offer Captained Sunset Sails and Corporate Team Building events. For more information, please call us at 1 (800) 684-WIND (9463) or (770) 945-8810.